Okay...maybe I happen to know the person who designed this app. And maybe he's awesome. But all that aside, he's really created something amazing for those of us who love to cook but hate to convert measurements! 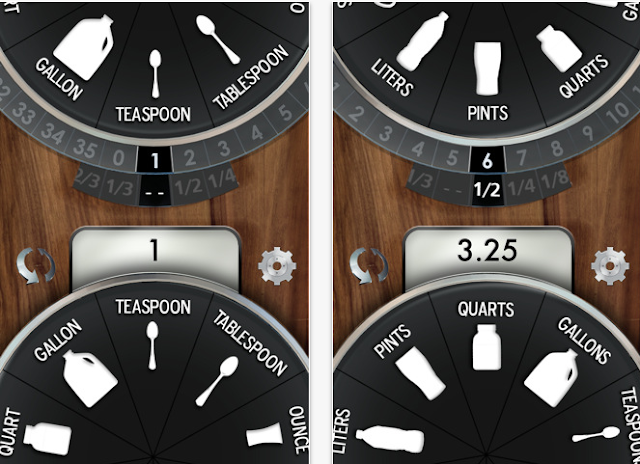 It's called Kitchen Dial, and I have been playing with it all morning since he announced that, after months and months of hard work, it's finally finished and available...for FREE! I love the design, which has a dial on the top, and one on the bottom, and you move them to certain numbers and types of measurements based on what you're trying to convert. I know I'm always running to my computer to try and figure out just how many tablespoons are in a cup, or cups in a liter, etc., and now all I have to do is whip out my trusty iPhone, which I'm usually using anyway to look up a recipe. Now, why don't you make your life easier and download it too?! What have you got to lose? The answer is...nothing. You're only going to gain two cups of awesome (that's 32 tablespoons for those of you without the app!). This app alone makes me want to get an iPhone! I would LOVE to have that! !